In February of 2018, I testified in front of the Kansas Senate Judiciary Committee regarding a bill which would make sweeping changes to the DUI laws in Kansas. Among the proposed amendments to the law were criminalizing refusals of breath tests (again), attempting to incorporate the specific DUI laws from all 50 states (and Puerto Rico!) into the Kansas law regarding prior convictions, and making it the crime of DUI to have “any measureable amount” of any drug in your system, regardless of whether it was actually causing impairment at the time of driving. Fortunately, the provisions mentioned above have been removed from the bill or modified since the time of the testimony. How the bill will be further amended as it moves through the legislative process remains to be seen. There is no doubt, though, that big changes are coming to the law. The current bill attempts to get rid of the implied consent advisories in criminal DUI cases, to allow prior DUI cases from other states to be used to enhance a Kansas DUI even if they don’t prohibit the same conduct that the Kansas DUI statute prohibits, and to allow breath tests as a “search incident to an arrest”, whether the person consents to a test or not. 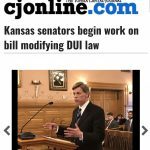 This bill was written by district attorneys who are still smarting from the cases which recently struck down the criminal refusal law as unconstitutional and rulings from the Kansas appellate courts regarding if and when prior alleged DUI convictions from other states can be used against a driver accused of a DUI in Kansas. There is little doubt that the legislature will give them most of what they ask for. As usual, the Kansas DUI laws will change effective July 1. The law in 2018 is likely to be substantially different than in years past, which only creates more issues for the appellate courts to attempt to untangle as everyone attempts to make sense of what the new laws mean and how to apply them going forward. It means Kansas DUI lawyers will continue to stay busy for years to come.